So, as I said, I have a new book coming out, which is always a thrill. It’s an updated and expanded edition of iPad for the Older and Wiser, which is still #1 on Amazon in the Hardware category in its first edition. That’s a huge success, given that it’s up against so many series that are household brands, and the Older and Wiser series is a relative newcomer. The publishers have done a fantastic job of marketing the book. The new edition, available on Amazon now, has been completely updated. Not only has the new (third generation) iPad been released, but Apple has also made a lot of improvements to all iPads through a software update. With the introduction of iCloud, there’s a different philosophy in using the iPad, since you don’t need to physically connect it to your computer to set up and use it now (although there are still reasons you might choose to do that). There are new apps including Messages, Newsstand, and Reminders, and the Notification Centre has been introduced to make it easier to manage and respond to alerts from your apps. The browser includes several new features (including the Reading List and tabbed browsing), and you can make simple photo edits using the iPad’s included software. There are lots of small changes that have been made too, including some new gestures. The whole book has been rechecked and revised where necessary, and there are 50 pages of new content, about a 20% increase. You can find out more about iPad for the Older and Wiser (including magazine reviews) here, and can order the second edition of iPad for the Older and Wiser on Amazon here. 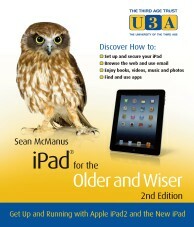 The first edition of iPad for the Older and Wiser will continue to be available while stocks last, and the free iOS5 guide still provides a handy update to that edition. My previous books in the Older and Wiser series, including Microsoft Office for the Older and Wiser, are still available too.